Francesco D'Orazio is the founder and CEO of Myrl, a social gateway for virtual worlds. Myrl is a project that will be composed several different services. Their first product, the Social Gateway for Virtual Worlds, has been released on September 2008. Francesco has been working over the past 7 years as a strategic communication consultant and qualitative researcher specializing in social media strategy and immersive marketing. He holds a Ph.D. in New Media Studies and Sociology from the University of Rome. 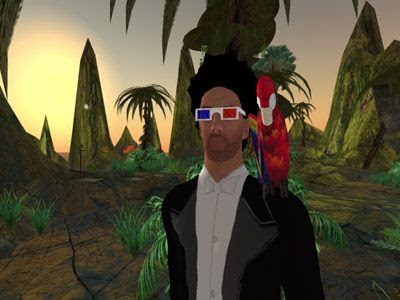 His research has been focussing on immersive communication, mapping the pervasive and ubiquitous spread of immersive strategies and tracking down the history of immersion from religious rituals, planetariums and panoramic painting, up to ambient music, experiential marketing, alternate reality games and virtual worlds. He is currently Lecturer in new media at the IULM University in Milan and is Senior Fellow at the McLuhan Program in Culture and Technology, University of Toronto. For users, Myrl's Social Gateway offers a way to keep track of their online activity in the different virtual worlds in which they're into, sometimes even with multiple accounts in the same virtual universe. This helps them to be more active and integrated in their virtual worlds. For corporations, organizations and websites, there are "Organizations" accounts, that can increase their web presence. Myrl supports 19 virtual worlds, and this list will always be expanding. Future Myrl services will allow its members to sign-up for new virtual worlds directly from Myrl, something that will increase its value not only for users but also for organizations and businesses. 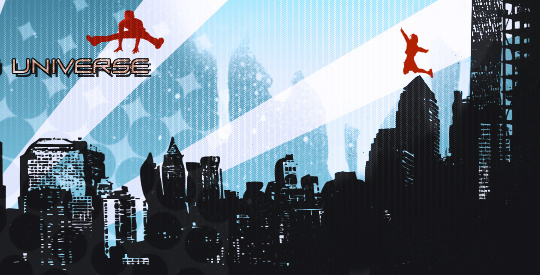 For 2009, Myrl is creating the 'Cross World Entertainment Platform', a feature set that will allow to explore and 'jump' from one world to another playing games and participating in challenges and competitions. If you're not on Myrl, you're missing the future bridge between virtual worlds. If you join Myrl, don't hesitate to visit Hiperia3D's profile. - How could we explain what is Myrl? - Myrl [My Real Life and My Role Life] is a cross-world platform that brings different virtual worlds and their users together on the web. We are building a layer on top of each virtual world, with the ultimate goal of linking them up to create an integrated playground with endless possibilities and applications. One of these applications is gaming, that’s why we think of Myrl as a cross-world entertainment platform. We just launched our first release, the Social Gateway for virtual worlds. Future releases will focus on immersive-storytelling, gaming across different worlds and virtual goods trading. - How did you had such an original idea? - I hit my head on the sink and came up with the idea of the Flux Capacitor, which is what makes worlds-travel possible. This is the official story. The unofficial story is that the idea for the cross-world entertainment platform didn’t came up at once, it was rather built brick after brick over time. The core idea was a response to the need to make virtual worlds visible on the web and the need to keep up with multiple virtual worlds easily. To do that we had to solve two problems: how to integrate virtual worlds and the web and how to connect multiple virtual worlds to create an integrated environment, easier to manage, funnier to explore. - What can users do in Myrl? - Virtual worlds users can manage multiple avatars from a single dashboard, share their virtual lives on the web, aggregate and manage all their content in a single place, keep up with virtual worlds friends, news and events via the web and the mobile, discover and access new worlds, communicate, search across and explore multiple virtual worlds. - What types of accounts can users create in Myrl? - Right now users can signup as Avatars or Organizations. The Avatar account allows you to publish a web based profile which is directly connected to your actions inworld, showing when you are online, what you are doing, where you are and allowing other members to instant message you from the web to inworld, something like a friendfeed for virtual worlds. Clearly the user decides whether to make what information public or private. Once you create this first profile you can then add as many avatars as you like and associate them to the first profile, so that you’ll be able to manage all of them from the same dashboard. The Organization account allows users to create a page that represents a brand, a project, a media platform, a business/service or any collective organization that operates inside virtual worlds and wants to keep up with virtual worlds users and maintain an open dialogue with them. - What virtual worlds does Myrl cover, and what do you expect to support in the future? - As Myrl is a social site, do you have some kind of popularity/voting system in Myrl? - Yes, we do, but it’s not really about popularity, is more about recognizing the value of experienced virtual worlds users as guides for the rest of the community. We thought it was crucial to provide users with a meaningful selection of the information available online about the various worlds. But the only reasonable way to generate this selection was by using a social criteria. So we started working on a digg-like system where users can myrl (vote on) the things they like, but we hybridized it with a slashdot-like karma system. Every avatar has a karma which grows through 5 levels, according to the user’s interactions within the virtual worlds and the community. The more time you spend in Second Life for example, the more your karma grows. The more it grows, the more you get ‘myrls’ (available votes), and so become more influential in the community. The leveling up mechanism goes like this: Tourist, Traveller, Explorer, Adventurer and Pathmaker. Right now we’re linking the karma system only to the social ranking mechanism, but it will play a central role in the cross-world gaming system. 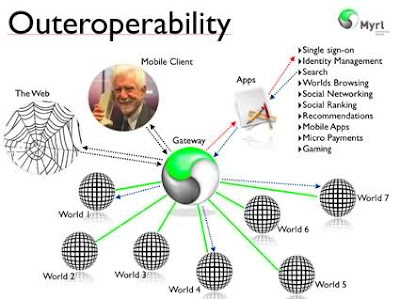 - What about the integration of Myrl with other Web2.0 services? - Virtual worlds users are already using many web2.0 services to share their images, videos, blog posts, tweets and so on.. on Myrl you can set up your account so that your content on platforms like Flickr, Twitter, Youtube, Plurk or your personal blog gets automatically imported in Myrl. We are acting as a hub for this content scattered across multiple platforms, offering a simple solution to easily aggregate it in a single place. - What's new on Myrl 2.0? - There are many improvements in this new release: we are supporting 19 worlds (2 worlds in the previous release), we added a multi-avatar system to manage multiple avatars from a single account and dashboard; we have redesigned the homepage, the sub-homes and the submit sections; we added a new “Worlds” section, showcasing 19 virtual worlds and providing editorial and social information about those worlds; we developed a new karma system, introducing the first unitary leveling up mechanism in the social virtual worlds space and we added the functionalities to aggregate all our external content on Myrl, making it very easy to import all our blogs, tweets, video and image streams into the Myrl account. - What are your medium/long term aims for Myrl? -We just released the Social Gateway for virtual worlds. Now we want to add more worlds and develop the integrations with all the worlds already supported. The next milestones are The Cross-World Gaming Platform and The Universal Trading Platform. But our toughest challenge isn’t really building new technologies, it’s more trying to change the perception of the virtual worlds space. People still see it as a collection of separated worlds rather than as an integrated space. We are building the tools to start browsing worlds like browsing web pages, it’s about switching from a context-driven mentality to a content-driven mentality, where we see and use the Metaverse as an immersive web of worlds. It’s a change that’s already starting to happen and that we intend to support and foster. - Do you think that the interest of people for virtual worlds is in its maximum point or that it will keep on increasing? @Mforiero, yes they will have their space here. Maybe in a future post I'll review them, and maybe their CEOs also will be interviewed. Myrl is a very excellent place, I will also review it deeper in future articles.